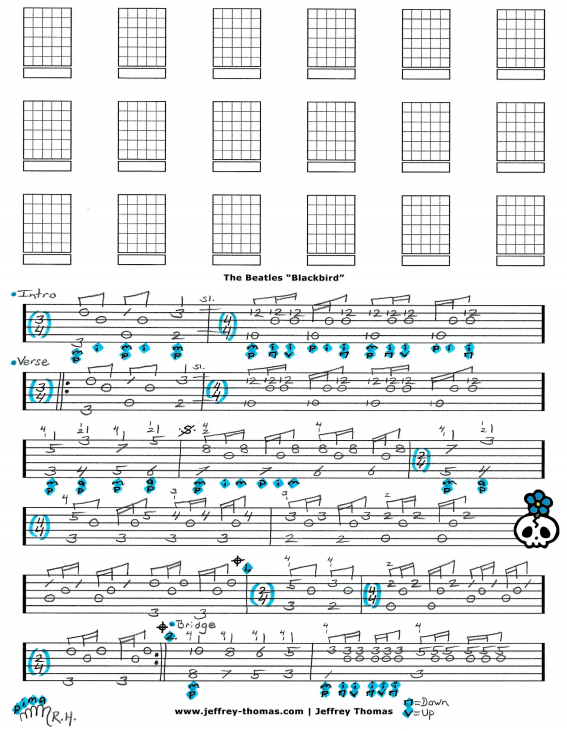 The Beatles Blackbird Free Guitar Tab by Jeffrey Thomas. Learn to play this classic acoustic guitar tune with my custom guitar tab following the original recording. Learn the fingerpicking details, song structure and proper rhythm. Want the full guitar tab for free? Go ahead and send your email address through the form provided and I will send it to you. Want to learn more about the fingerpicking used in this song? Fill out the Schedule A Free Lesson form and we can set up your free Skype guitar lesson! Did you know McCartney has stated that the lyrics of the song were inspired by the unfortunate state of race relations in the United States in the 1960s. Find more popular online guitar tabs on my blog, video and tab pages.